Menopausal stomach weight gain is common. As people age, it becomes easier to gain weight, and extra weight usually gathers around the hips and waist in women. Weight gain around the abdomen can be dangerous for a woman's health because it puts more stress on the area, and being overweight or obese increases a person's likelihood of developing several different diseases and conditions, such as heart disease, type 2 diabetes, and high blood pressure. However, a woman can take certain measures to control weight gain as she goes through menopause. 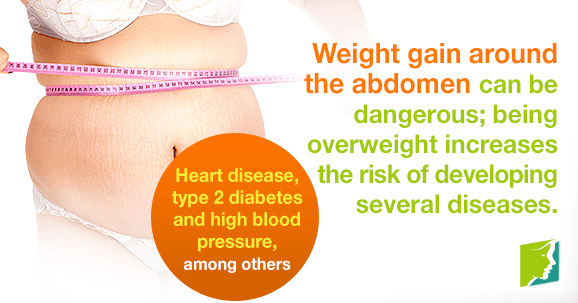 Why Be Concerned about Abdominal Weight Gain? For people who have a healthy BMI, eat a balanced diet, and exercise regularly, abdominal weight gain can come as a surprise, and it may be frustrating to gain weight when you have not changed your lifestyle. Research has shown that the hormone estrogen controls how fat is distributed in the bodies of women. As estrogen levels decrease while a woman progresses through menopause, her body's distribution of fat may also change. Menopause causes body fat to migrate to the abdomen and waist of a woman. This can be frustrating and make a woman feel like she has gained weight. This redistribution of fat can also be compounded by an actual gain in body fat during menopause. Older people are at a higher risk for weight gain because as the body ages, muscle mass decreases and body fat levels increase. It takes more calories to maintain muscle than it does to maintain fat. This means that if your body changes and has less muscle mass, then you need fewer calories to maintain your weight. Weight that is gained around the middle is dangerous because the fat is surrounding vital organs, and weight gain in general can lead to diseases such as type 2 diabetes. Research has also shown that even if a person is within a healthy weight range, that their risk for heart disease increases if they have excess fat around the abdomen. In order to lose weight and maintain a healthy weight, it is important to consume fewer calories and to ensure that the calories consumed are healthy and provide the vitamins and nutrients that the body needs. Even though it is important to cut back on calorie consumption when trying to lose weight, it is also important to eat regularly and not skip meals. Skipping meals is associated with abdominal weight gain and type 2 diabetes. This could be because skipping meals leads to binge eating, and skipping meals also causes large spikes and drops in blood sugar levels, which can lead to insulin resistance, a precursor to type 2 diabetes. Although weight gain is common worry, especially abdominal weight gain because of its impact on body image, it is particularly important to control abdominal weight gain because of its health impacts. Click on the following link to find out more about weight gain during menopause.